E-books and tablets are growing in popularity and devices are widely available with many different types from which to choose from. 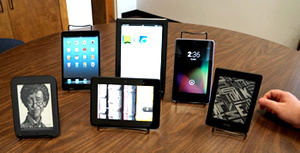 For the purpose of providing hands-on familiarization and training with e-readers and tablets, the Maine State Library created a "Technology Petting Zoo" of devices. Libraries will learn how different devices work and will be able to explain their use to library patrons. Librarians can request the different type devices for their training from the "Technology Petting Zoo. Each device comes with a USB cable and AC adaptor, and each zoo is delivered in a ruggedized case with built-in power strip so the devices may be charged within the case. There are six zoos in all, and two sets of display locks that may be requested so the devices may be secured for public display.